The Story of the First Flute, a wonderful and creative book for children of all ages. Expressively and vividly written by Hawk Hurst and creatively illustrated by Lindley Sharp, this is a delightful and endearing story which is sure to uplift the spirit and warm the heart. Gently and humorously written, this Cherokee legend speaks simply and beautifully to the heart of the child in each of us. We are reminded that we each have something of special importance to share with all whom we meet. The imagery and style found in The Story of the First Flute evokes an earlier time when people listened, eager and wide eyed, to the oral tales passed down from generation to generation. Lindley Sharp’s distinctive and original woodcut designs perfectly illustrate and compliment this heart-warming story. 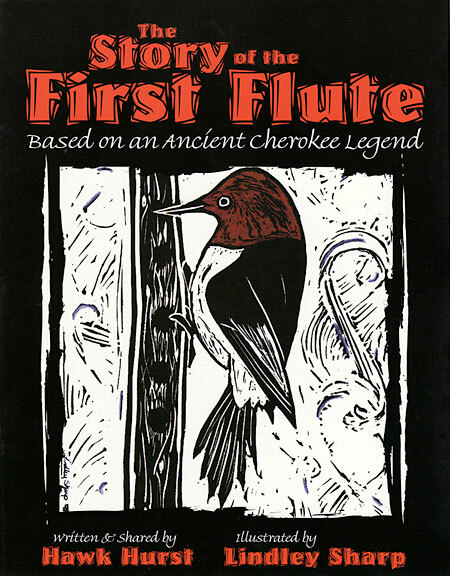 The Story of the First Flute is stunningly illustrated by Lindley Sharp’s beautiful block prints. 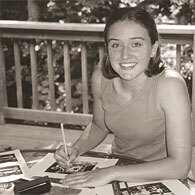 Lindley was born in Mississippi and moved to Boone, NC, with her family when she was five years old. A graduate of Furman University in Greenville, South Carolina, she and her husband currently make their home in Atlanta, Georgia. Lindley’s artwork has appeared in other children’s books, including MeeMa’s Memory Quilt (Parkway Publishers, 1999). After meeting Hawk, who was a visiting artist at Watauga High School, Lindley designed a mandala for his summer camp t-shirt, before collaborating on this project.